Designed for young people, this vest is a nice gift to give to your students or tell them about! It’s the latest design from Teen Yoga, available in various sizes. This pure cotton white long sleeved top is a great way to show off your TeenYoga credentials and help further awareness about the benefits of yoga and mindfulness for teens. 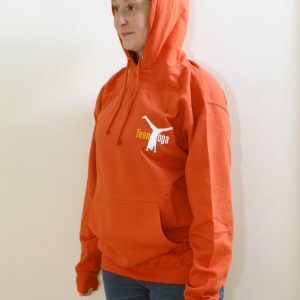 This hoody is a great way to show off your TeenYoga credentials and help further awareness about the benefits of yoga and mindfulness for teens. This pure cotton yellow t-shirt is a great way to show off your TeenYoga credentials and help further awareness about the benefits of yoga and mindfulness for teens.